Jason Hartman: Welcome to the Holistic Survival Show. This is your host, Jason Hartman, where we talk about protecting the people, places, and profits you care about in these uncertain times. We have a great interview for you today and we will be back with that in less than 60 seconds on the Holistic Survival Show. 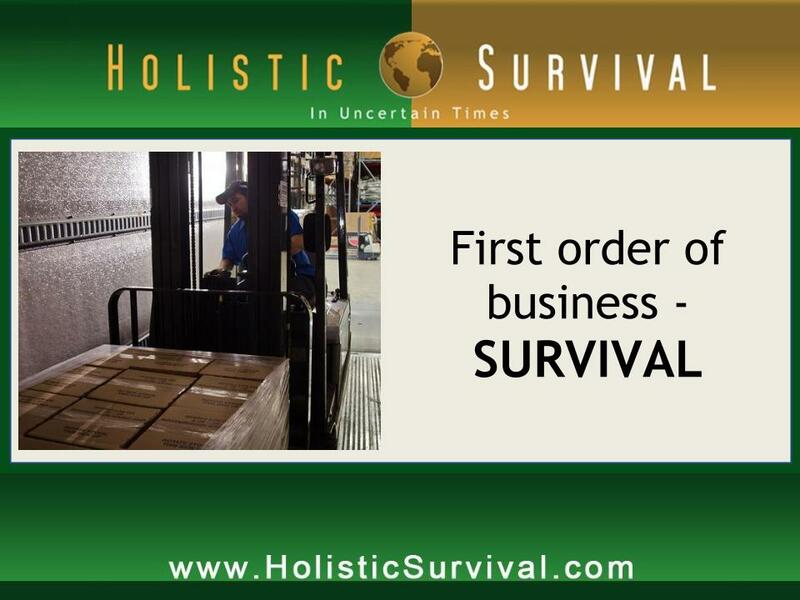 And by the way, be sure to visit our website HolisticSurvival.com. You can subscribe to our blog which is totally free, has loads of great information, and there’s just a lot of good content for you on the site. So make sure you take advantage of that at HolisticSurvival.com. We’ll be right back. Narrator: Now is your opportunity to get the Financial Freedom Report. The Financial Freedom Report provides financial self-defense in uncertain times, and it’s your source for innovative forward thinking investment property strategies and advice. Get your newsletter subscription today. You get a digital download and even more. The price, only $197. Go to JasonHartman.com to get yours today. Jason Hartman: It’s my pleasure to welcome Patricia Spiggereli to the show. Her late husband is the author of The Crisis Preparedness Handbook, which is a comprehensive guide to home storage and physical survival. Patricia, it’s great to have you on the show today. Patricia Spiggereli: Thank you so much. Jason Hartman: So, we live in a pretty uncertain world nowadays with the economy, with natural disasters, with all the stuff going on, the threats of civil unrest and everything else. There’s really a real need for this I think now probably more than ever in recent history. What do people need to know about security in such an uncertain world? Patricia Spiggereli: Well, I think first of all each person needs to decide for themselves what kind of scenario they might be needing to be prepared for. And that can range from just being prepared for a bad winter storm or being prepared for a total breakdown of society. And it runs the gamut in between those two things. Jason Hartman: And in terms of how one prepares for that, there are real differences in type of preparedness, aren’t there, in terms of what might possibly occur? Patricia Spiggereli: The kinds of things that you need to be prepared for vary for sure. And, of course, the kind of preparation for each one of those different scenarios would be different. I think, again, it’s kind of a personal decision. I know when my husband was writing the book, he felt that really there were lots of possibilities and the future is uncertain. And I think in the last 10 years we’ve seen a lot of uncertainty come through. Jason Hartman: We sure have, we sure have. Well, there are some basic fundamental things in terms of preparedness that everybody needs to do and will apply across all situations pretty much. What are some of the frameworks of total preparedness as he referred to it in the book? Patricia Spiggereli: Well, I think when we look at a framework, we’re talking about 3 different things. The first one would be material provision, in other words what kind of things do you want to have in your household, in your home, that would help you maintain a somewhat reasonable lifestyle for a while? That would be things like food, water, fuel, ways of keeping warm, things like that. And then a second area would be actual personal preparation. And although I think material preparation is really important, personal preparation probably is even more important because those are the kinds of knowledge and the skills and things that you know that you can’t just invent on the moment when there’s a crisis. It takes a while to learn things. It takes a while to practice them. It takes a while to see how they actually work. And then there’s also the idea of having enough financial resources to take care of both of those two things and develop your own storage, develop your own kinds of talents and skills that would help you in a crisis. Jason Hartman: Sure. So the most important framework is mindset and knowledge and understanding of threats and preparedness, definitely. And that’s what this book is about. So when we talk about food and water stockpiling, a few years ago if anybody had talked about this in the United States of America, most people would have sort of dismissed it as irrelevant or paranoid or crazy, but nowadays I see more and more people that are really paying attention to this. Patricia, what are some of the fundamentals that people need to be aware of to be successful at this? Patricia Spiggereli: Well, you really have to know, first of all, what kinds of food you want to store, and then you need to know how long it will last, how much space it takes, where are you going to put it in your situation, when will the nutrition run out, those are some of the reasons we rotate storage things. The ideal thing with storage is to use the things that you’re keeping in storage. In a way, it’s kind of like having a grocery store in your home. When you need peanut butter, you can go down and get a peanut butter jar from the storage that you have of peanut butter, just for an example, any of that kind of thing. Jason Hartman: So, in terms of the food, I mean there are commercial plans, there’s sort of a 7 day plan. And a lot of these crisis situations that might unfold, they won’t necessarily be long, but people take for granted, Patricia, that they can go down to the store, that they can go to the restaurant, this will all be available. And it’s a very unfortunate situation. People should be prepared to survive for a good week without support services. Do you want to talk about maybe what’s involved in some of these different food storage plans? Patricia Spiggereli: You’re right. You do need to have different kinds of food storage I think. First of all, you might have a short term emergency where the electricity is off and the roads are blocked with snow and you can’t get to a grocery store. And if you could get to one, all of the food has been taken by the people that got there ahead of you. So that means you’d want to have a week’s supply perhaps. And those kinds of foods would be the typical foods that you normally eat. You might want to consider that you won’t have electricity, you won’t have gas possibly to cook those things. So how are you going to eat them? You need to think about food that doesn’t have to be refrigerated. If you have water supply, then you can re-hydrate food as well. So I think that short term kind of crisis, whether it’s a storm or even it could be a trucker’s strike, something of that nature, where you don’t have access to the grocery store, you have your own short term supply, and then I think gradually you develop a long-term supply if you feel like you are going to face a long-term kind of crisis. Because then you would maybe be relying on solely what you have in your own storage. And that kind of storage, it’s hard to store a year’s supply of the typical foods that you eat and a typical American diet. So that kind of storage, I like to look at it kind of like insurance. You might have basic foods that you can use, and you have the skills and the knowledge and the tool and equipment to prepare those kinds of things for your family, and those kinds of things are in a long term storage. And in the book, as Jack wrote the book, he kind of came up with the idea that certain kinds of diet requirements need to be met. And sometimes in a storage situation, you hear about certain things like wheat or flour, sugar, honey, dehydrated milk, those kinds of things that are pretty basic and you could survive on those things if you needed to. You may not like the diet. You’re going to lose a lot of variety from it. So Jack’s idea was that you would supplement those things with the kinds of things that you ate on a normal basis. He really describes in the book a different kind of planning, actually calculates the calories that a person would need, whether it’s a teenage boy that’s really active and working hard, and in a survival kind of situation you would use a lot more calories than we do in our modern world. There would probably be a lot of physical labor that would be involved. So he takes those kinds of things into consideration and that’s how he describes a food storage model in the book. And he describes very clearly all different kinds of modes of food. Some people like to be able just to go and buy, if they have the resources for that, a set of dehydrated food and put it away in the basement and hope that that will be okay someday. I don’t think most of us really want to do that. We want to be able to be sure that what we’re storing is something that we really can eat and will eat. Jason Hartman: Patricia, food is very important as you mentioned of course. And I like how Jack really paid attention to, in survival scenarios, one may be expending a lot more energy, a lot more calories, and that’s going to require something of a modification to their diet in order to be satiated. But what about water storage? I mean, in terms of an emergency water supply, what do people need to know about that? How to store it, does water last forever, does it have indefinite shelf life, do you need to disinfect it after a certain amount of time. There’s a lot more to it than some people think, isn’t there? Patricia Spiggereli: Well, I think so. Our own experience with water was that you can store water, and we’ve even got storage of big barrels of water, but I don’t trust that that water’s going to be clean and suitable for drinking. So I think you also need to have some kind of a water purification system. And that can be a filter – that’s my favorite way to clean water, is with a filter. But I think, more than that, there are some ways to store water. For example, your water heater has water in it, but I know people who have connected three tanks to their water heater so the water comes into their home, goes into tank 1, then tank 2, tank 3, and into the water heater, and then to the rest of the home. And so all along they have that water and it’s constantly being used and filtered through the house as they use it. So in an emergency where you don’t have water coming into your home, that water is there available, ready to go. Jason Hartman: That’s a good idea because that water is always fresh, it’s always refreshed. The typical water heater is 40-50 gallons. So if they put two other tanks on that that are the same size, they may have 150 gallons of nice, fresh water or so, huh? Patricia Spiggereli: Right. And then you have to be able to turn it off so that it doesn’t get impurities in it. In a situation, you have be able to turn it off and make it isolated. Jason Hartman: Right, right. So what you’re talking about there is like a back flow situation, right? Jason Hartman: Yeah, good point. Patricia Spiggereli: Another thing that is kind of interesting, people say “Well, I’ll just go down to the local grocery store and buy some gallons of water and store it in my shelves in my basement.” Well, those plastic containers that the water come in are not very long shelf life, because we’ve actually stored water that way and gone to get the water to recycle it and the water’s empty, it’s just gone out of the container into the concrete in the basement. So you have to be careful then. My point in saying that is it’s good to have that kind of water storage, but you also need to continually use it. If you have gallons of water, then just continually put those in the refrigerator as you use them and replenish your store. So that’s another way if you didn’t go to the extent in the extent of having big water containers. Jason Hartman: Yeah, very good point. So rotate the supply of food and water, excellent point. Let’s talk a little bit about, if we can, Patricia, food production. And this is for a short term thing, because if you have a garden full of food, that becomes your supply right away, and it’s nice and fresh which is great. But it also becomes a long term scenario. If we have major depression, economic collapse, energy prices skyrocket, the big earthquake if you live in earthquake country for example, that garden can become very, very important. What do people need to know about the food production side of things? Patricia Spiggereli: Well, you have to have two things if you’re going to produce your own food. First of all, you have to have the materials to do it and, second of all, the knowhow of how to do it. For example, if you’re going to be canning things from a garden, you’ll have jars, you’ll have the canning processors, you’ll have all of the things that go to putting a jar together. One of the important things is to stockpile the canning jar lids because those are expendable as you use the jars. So you’ll need to have that kind of material. But even more important than the materials is the knowledge of how to do it. It’s not hard, and I have six children and all of them, I guess by example – they were never forced to do this, but they all canned something. They all bottle things like tomatoes or things like green beans or just whatever their favorite is. We all have a favorite spaghetti sauce that we like to can and we use that. And so that kind of production is important. Also, you can produce things by dehydrating. Again, the knowledge is important and that comes from actually trying it. And even gardening itself, some people will stockpile seeds and of course the seeds that can be…I forget what they’re called, but they’re the kind of seeds that you grow and then you can gather the seeds from them. They’re not genetically altered. They’re the old-fashioned kind of seeds. Jason Hartman: Isn’t that nice Monsanto didn’t interfere in nature this time? Good. Patricia Spiggereli: Yeah. But those are the kinds of seeds that you can store and then you can gather the seeds and reuse them, much like the ancestors did. But gardening is a real fine art and I know that from experience that the first garden we has was, I’ll admit, pitiful. Things just did not grow very well and we learned a lot from that. And now I have a wonderful garden to share. And I’ve changed over time the kinds of things I grow. I’ve learned to grow my corn in 3 or 4 different stands so that we have fresh corn on the cob. But those kinds of things don’t just happen. You have to learn how to do it. Even how deep to plant the seed, something as simple as that, if you’re gardening for the first time, you don’t necessarily know that. And if you’re in a survival kind of situation, there’s kind of a panic that goes there because you’re thinking, wow, if these seeds don’t sprout, are we going to have food to eat? So in good times you might say it’s good to have those kinds of production kinds of skills that you’re comfortable with and is part of your life. It’s not something that all of a sudden you’re starting to do, but something that comes along with experience over years. Jason Hartman: That’s a great point, because, like you said, your children are doing this just as a natural part of their daily life. So whenever it’s really needed for survival, it’s nothing different. It’s something they’ve done, they’re familiar with, and they know how it all works, right? Patricia Spiggereli: Right. Actually it’s kind of interesting to see the younger generation, there is a real big interest in this I think across the country. We’ve sold the book to different parts of the country – we’ve had all kinds of responses from people who are thinking about the future and how they can make sure that it’s safe for their families. And it’s really interesting. It’s kind of a grass roots survival movement maybe you could call it. Jason Hartman: No, I agree. It definitely is. And it is good to see people thinking about this stuff. So when we go past the food issue, you talked a little bit about food preservation which is great, what about other preparations? People need to think about clothing, bedding, heat, light, medical stuff, all of that kind of stuff. What are your thoughts on those things? Patricia Spiggereli: I think, again, you kind of have to have your own scenario in mind of what you think could happen. Like, I live in the inner mountains and I think we could easily have an earthquake where I live. We could also have an interruption because of a storm. So I want to make sure I have the kinds of things that will keep us warm. Depending on what your scenario is, that’s how you would prepare. And I think in the book, we explain a lot of the things that you could do to prepare in those areas. Jason Hartman: He talks about in the book different types of threats, and uses the acronym NBC, nuclear, biological, and chemical, right? Jason Hartman: And so what are some of the things people think about in terms of those 3 NBC types of terrorism? Patricia Spiggereli: Well, there’s a couple of different things, and Jack discusses this in the book, you have to decide where you live is going to determine maybe what you do also. One of the things I think is really important to know is how to make part of your house into a safe room so that you can seal it off from contaminants. Usually those kinds of contaminants are going to be fairly short lived. They’re not going to go on. It’s a matter of surviving for a shorter period of time. So I think you have to be prepared for that, and I think that’s one of the strengths that you can have is to have a way to seal off part of your house so that it isn’t going to be contaminated as much as possible. Jason Hartman: Definitely a good point. I think an area that a lot of people are in for a very rude awakening on is the area of communication. Because people tend to take for granted that they’re going to have the internet, they’re going to have their cell phones, and it is, in my opinion, very likely that neither of those will be available to people. And I think it’s very important that people have radios, CB radios, HAM radios, family type walkie-talkies, because we can’t just assume that we’re going to have all of this great modern communication we have now, can we? Patricia Spiggereli: Right. One of my favorite communication devices is a radio. It’s a radio where you receive information, not so much that you give information. But I like it because it’s operated by solar, by hand cranking, and by battery. And so that’s something to have just so you know what’s going on in the rest of the world around you. And you may not be able to communicate with it. But all those things that you mentioned, if you’re going to have walkie-talkies so you can communicate at short distance, you’ve got to have the battery backups for them. All of those kinds of things, again, Jack discusses those in the book. And I might also say that the focus of this book is kind of a general outlook on preparedness. I think it’s a really good starting place for people. And then if you want to know more details about communication, and quite frankly communication things are changing frequently, so I think then you go to maybe more a book that’s just especially about communication. You can do more research that way. I think the thing that’s really a strong point about this book is that it gives us a good checkpoint so you can check off all of the different things that you might want to consider for your own personal survival outlook. Patricia Spiggereli: If you think about even a storm or an earthquake, any of those kinds of things would likely disrupt communication. Jason Hartman: No question about it. Well, the book is the crisis preparedness handbook. It’s a comprehensive guide to home storage and physical survival by Jack Spigarelli. And we’re grateful to have Patricia on to share this with us today. The website is CrisisPreparedness.com. And, Patricia, I assume the book is available on Amazon.com, bookstores, etcetera, right? Patricia Spiggereli: Right. And we sell it also on our website. Jason Hartman: Excellent. Well, thank you so much for joining us today. Everyone should go out and get a copy of this. And we appreciate the insights. Announcer: What’s great about the shows you’ll find on JasonHartman.com is that if you want to learn more about investing and real estate in different markets, there’s a show for that. If you want to learn 17 ways rich people think and act differently, there’s a show for that. If you want to know how to get paid to borrow, there’s a show for that. And if you’d like to know why Amsterdam doesn’t take dollars or why pools are for fools, there are even shows for that. Yep, there’s a show for just about anything only from JasonHartman.com. Or type in “Jason Hartman” in the iTunes store.